If we’re being frank, the last few weeks have felt like rock bottom. 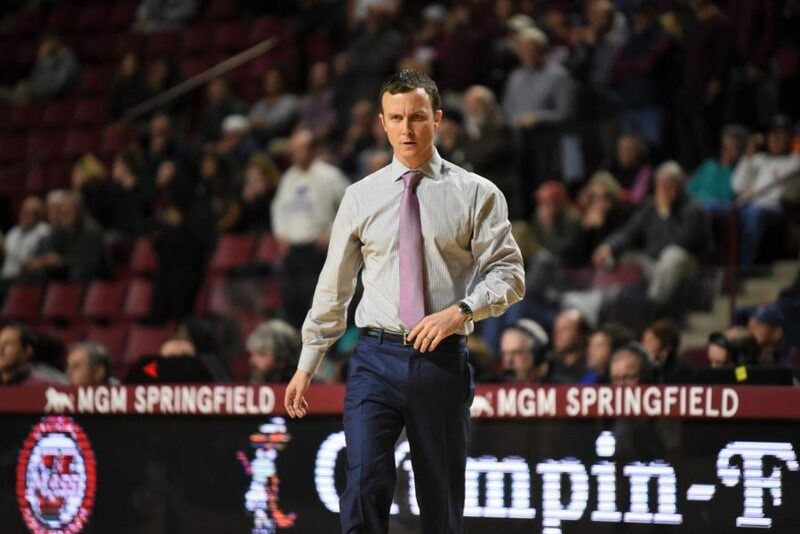 After a blowout home loss to Atlantic 10 bottom-dwellers Fordham, during which the Rams held a 30-point lead on UMass’ own floor, the Minutemen sit at the very bottom of the conference standings. They’re 1-9 in conference play, losers of 10 of their last 11, and with A-10 leaders Davidson coming to town Saturday – and with Luwane Pipkins still day-to-day – things are poised to get even worse. Matt McCall was really honest with us at practice on Thursday — he often is — and at some point I realize that I can only write so many columns explaining the same problem and trying to dissect why this team can’t seem to hit a shot when it needs one. So today, I’m going to let McCall do a lot of the talking, and hope that it gives a better sense of the state of the program than I could really provide. For anyone wondering if McCall was bluffing when he said Wednesday night that the team would not be practicing in the Champions Center, the team’s sparkling practice facility, he was not. UMass practiced on the Mullins Center floor Thursday, and with hockey taking center stage on Friday, the Minutemen will move their Davidson prep to the Curry Hicks Cage. “They’re not allowed in this building,” McCall said. “Not allowed. The blood, sweat and tears it took to build this building, because of previous players, because of generosity from our donors — if I’m a donor right now and I’m watching that, I’m like, why would I donate money to UMass? These guys don’t play the game inspired, right? So, they don’t deserve this. They’ve got to earn it. There’s been so many people that want to see this program do really, really well, and they donate their own money to see this program really, really well, and have a facility like this, like John F. Kennedy has done, or Marty Jacobson, these guys that have been so loyal to our program. McCall’s been frustrated with the way the ball has refused to drop through the basket in recent week, as anyone would be, but the deeper frustration this week lies in the effort. “Listen — if we played really, really hard last night, we would’ve won the game,” McCall said. “We would’ve won the game. We didn’t play hard. We had no fight, no resilience, no toughness, no anything. That’s not to take anything away from Fordham, give them a lot of credit. They came in with a great gameplan, they switched defenses, they want back to man-to-man, and they made a lot of tough shots. But when you’ve got a freshman point guard who’s splitting you in pick-and-rolls and getting down the lane and going for 18 points, six assists and no turnovers, against a team that’s been pretty good defensively throughout league play, that’s a problem. So if you just play harder, and get guys that are going to completely buy in and be connected, you’ll win more games. It’s as simple as that. McCall was especially frank about “setting the culture,” on Thursday, as he was about a lack of full buy-in across the board. “[I’m] not great,” he said. “I don’t want anybody to feel that, I want our players to feel me marching forward, but there’s just a certain standard we have to play to, and if we’re not playing to that standard, then guys have to be called out, and I think that for me as a coach, this is completely, 100 percent, absolutely, right now about setting the culture, and who’s going to be bought into everything we’re doing. We walk around entitled — entitled for what? Nobody’s won. Nobody in this program has won. Didn’t win at your previous school, didn’t win at this [school], nobody’s won. As far as McCall is concerned, that’s what sets this team back, and what differs between the 2018-19 Minutemen and successful UMass teams of the past — buy-in, effort, inspiration. “This is no disrespect to any former coach, any former player — UMass has had a pocket of success. There have been a lot of bad teams here too. But what do the really, really good teams have in common? They had an appreciation level for being here, and they played the game so inspired. Nobody knew who Edgar Padilla and Carmelo Travieso were. People knew Camby — did anybody really know Lou Roe? And that guy played with a vengeance when you watched him play. Even the stretch when Travis [Ford] was here that they beat us in the NIT, those guys were like, Luke Bonner was a transfer, Monty Mack played the game with such a vengeance and passion — and we’re just out there going through the motions. And that’s the frustrating part. “How many guys right after the game are going to go on social media and tweet a picture of themselves making a layup or making a play. To me, I don’t want to go anywhere near social media after a game. It’s embarrassing. Unique McLean has struggled to find court time this season, but will start against Davidson, according to McCall. “I’ve been very critical of Unique since I’ve been here,” McCall said. “Of him going through the motions, not playing hard all the time, his facial expressions, a lot of different things. And, I think, when you’re sitting on the bench, and all of a sudden you get an opportunity, you want to make the most of it. The one thing I’ll say about Unique, even when he hasn’t been playing, he’s still been a good teammate on the bench. We needed a lift against St. Joe’s, and he gave us that lift. He’s playing the game, to me, a lot more inspired, and he appreciates being out there. McCall also spoke about the strain of losing that he’s had to keep from affecting his family, and came into the facility Thursday at his “normal time. It’s not Brooklyn’s fault, so I like to take her to school as much as I possibly can, to spend some time with her. Didn’t go to bed very early. I’ve been fortunate to be a part of a lot of games, a lot of wins, a lot of losses, and I’ve never been on the side of a more uninspiring effort. That’s the frustrating part, and I told our team that. You guys think us running a lot in practice is because we lost, it has nothing to do with that; it’s because we didn’t play to the standard of what this program’s going to be about. To me, that’s the most disappointing part. That’s pretty much everything we learned from McCall this week. This is almost more of a Q&A than it is a column, but with the program sitting where it is right now, I felt like it made more sense to give Matt McCall the stage this week, considering the breadth and depth of his post-practice interview on Thursday. Say what you want about Matt McCall, about his rotations or his gameplan, of his after-timeout plays or his ability to get the most out of his players — the guy cares, and I don’t think these struggles have hit anyone harder. Perhaps we’ll see a different team over these next couple of games, and next week there’ll be more to talk about. I blame McCall. He should have dropped Holloway for his “So what” attitude after his first season. Holloway is the laziest player on the team and gets to start almost every time. He is what UMass is.